Following numerous enquiries from Machin collectors on how best to mount or keep their collections, Connoisseur Publications launched the Connoisseur Album for Machin Stamps in 1991. Prior to this there had never been a printed album that even partially filled the needs of the specialist collector, so it comes as no surprise that the album has been widely welcomed as the only realistic choice of album for the Machin specialist. Following the launch of the initial section covering single stamps, there was heavy demand for pages covering other aspects of Machin collecting. The result is that the album has developed into a modular system, enabling the specialist to purchase just the sections that interest him. Currently available sections cover Single Stamps, Coil Strips and Stitched Booklet Panes, each split into pre-security (issues up to 1992) and security issues (issues from 1993 to date). 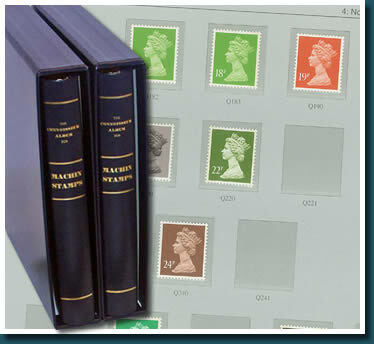 Connoisseur Publications has had a long association with the Machin field, being the publishers of the much acclaimed, international award winning Connoisseur Catalogue of Machin Stamps, now in its 10th edition. The same care and attention to detail and accuracy that is evident within the Catalogue, has been lavished on the Album, making the Connoisseur Album System the most comprehensive, well thought out and clearly presented deluxe hingeless storage system for Machins yet to be devised. As you might guess the album is as comprehensive as the Connoisseur Catalogue itself, with the combined pre-security and security single stamp sections running to over 370 pages. 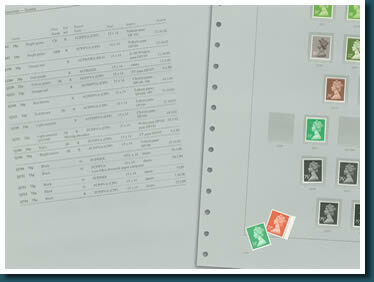 There are spaces for every single Pre-decimal and Decimal Machin stamp, Regional & Postage Due listed in the catalogue — many thousands in total. This covers all the printers, all paper, gum, perforation (including unperforated edges), ellipse, phosphor and fluor types, redrawn values and emblems, value settings and thicknesses, phosphor screens, glazed papers, phosphor under ink, screened values, major shades, etc. In addition there is also a space for every listed variety – errors of colour, missing colours, missing phosphors, broad bands, short and inset bands, A.O.P.’s, uncoated papers, F.B.O.’s, Specimen overprints, etc. Only imperforates are excluded (as they can vary in format), but this needn’t limit your collecting as matching blank leaves are available for collectors to mount as they wish. Similar comprehensive coverage is also given to Coil Strips and Booklet panes, with the various selvedge perforation types catered for. The album is laid out in much the same way as the catalogue. On the left hand page is a detailed description of all the stamps, coils or panes to be mounted on the facing page, giving invaluable information such as issue dates, head types, settings, catalogue numbers and sources – a truly authoritative ‘write-up’. The right hand facing page has a space for each item described on the left, identified simply by the catalogue number. Extensive introductory notes are included, explaining the terms and abbreviations used, and with useful fold out reference charts for value types & settings, and short and inset phosphor band formats, to avoid turning back and forth from the relevant pages. Fuller information with regard to production and printing methods and comprehensive identification notes can, of course, be found in the Connoisseur Catalogue. All facets of the album are produced to the highest specifications, as demanded by today’s discerning collector. Binders are hand made to ensure long life & quality, covered in a padded “Skai” finish in navy blue, with elegant gold blocking on cover and spine. Matching slipcases are also available. The album pages are held within the binder by the widely adopted multi-ring system, ensuring that the pages always lie flat, and that it is easy to take out, move or replace individual pages with the least possible effort. The pages themselves are of high quality heavy duty pale grey cartridge paper, chosen in this colour for contrast to best display the perforations and unperforated edges, but without overpowering the page with a series of black rectangles or boxes, as adopted by other systems. 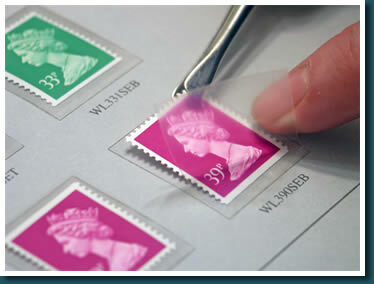 The stamps are held firmly in place by the finest individually hand affixed crystal clear mounts, guaranteed against chemical reaction and 100% safe. Supplements are published to ensure that the album is brought up to date to include all the latest developments and discoveries. All customers who have purchased the album are encouraged to register it with us to receive full details of these supplements (a reply paid registration card is supplied with the initial purchase), and any further related products that are published. From the above we hope you will see that there simply is no better choice for the enthusiast. In its flexible, modular format, you are able to collect just the fields of Machins that interest you and there is unlimited scope for customisation. But if you require more proof please ask us for a complimentary sample album page and you will see the quality and care lavished on this product. 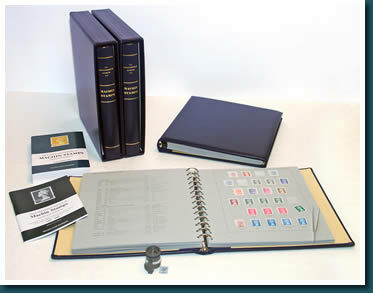 Put simply the Connoisseur Album System is the ultimate for the Machin Collector.